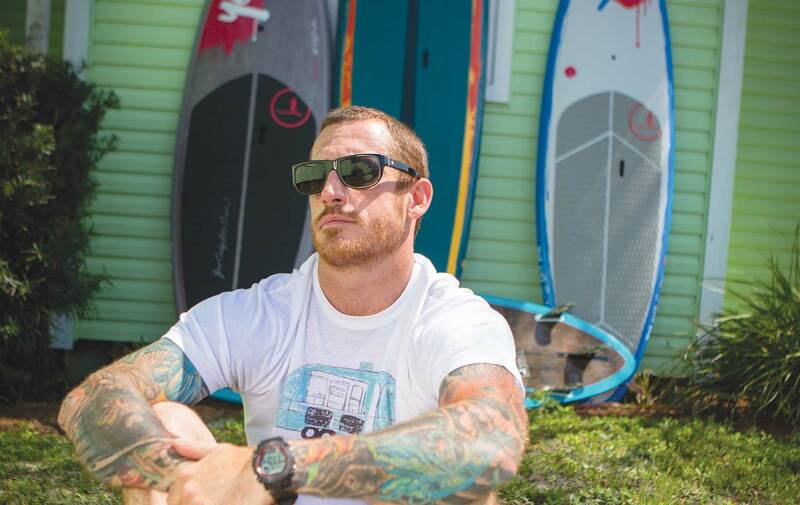 Since we last caught up with Justin in the VIE 2012 Home and Garden Issue, his work has become even more well known throughout the Emerald Coast region and now on an international scale, thanks to his recent collaboration with the leading producer of stand-up paddleboards, YOLO Board. YOLO Board is not the only popular local brand to hit Justin up for his sweet style. Highly recognizable among locals and fans alike, tourism website 30A.com worked with him on a series of T-shirt designs this year and last. The tees feature a redfish, a Land Rover, an Airstream trailer that is reminiscent of the food trucks in Seaside, Florida, and the iconic 30A.com “Life Shines” logo. “I think my work was a good match with YOLO and 30A.com because both brands have a very carefree, relaxed vibe to them,” Justin says. “I don’t know, but somehow, we complemented each other.” He was also one of many artists whose work was featured as a stage backdrop during the 30A Songwriters Festival this year. His piece featuring the words “Song Ain’t Dead,” etched alongside a gritty portrait of rocker Kurt Cobain, inspired the title for the recap of the festival in this issue of VIE. Justin’s perspective has obviously struck a chord with those who see his art, as evidenced in his many recent accomplishments, and he shows no sign of slowing down anytime soon. Aside from his successful brand collaborations, Justin’s work has been in galleries, art shows, magazines, and blogs around the country. He was named “Best Mixed Media” artist at 2012 ArtsQuest in Seaside, and his work is featured on the 2013 ArtsQuest promotional poster. To learn more, and to see more of Justin’s work, visit www.jlyonsart.com, and “Like” Justin Lyons Art on Facebook. Justin’s original artwork is available for purchase at A.Wickey Studio-Gallery in Seacrest Beach, Florida, and at www.jlyonsart.com.